Fine-quality weight, 20-lb. unpunched paper. Strong chipboard back for easy handheld use. Wide-ruled on front and graph-ruled on back. 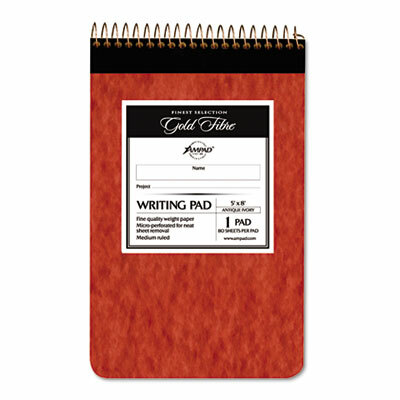 Go retro with this "on-trend" writing pad. The vintage design pressboard cover is sturdy and stylish. Top wirebound perforated pages provide clean and easy sheet removal. The book holds 20-lb. premium paper sheets with sepia toned ruling.